New techniques for managing grazing animals are producing dramatic results that empower the farmers to create grazing systems that are truly effective at meeting their farm and quality-of-life goals. In this comprehensive, nationally known grazing consultant Sarah Flack builds on a solid grazing foundation of the key principles of grazing management to help farmers design and manage successful grazing systems for dairy and beef cattle, goats, and sheep. Her advice is well suited for all farms in mesic (non-dryland) regions. Farmers and their farms will benefit greatly from Flack's message that, in partnership with their animals, they can create profound change in pasture quality and productivity and in the performance of the livestock. The book's unique approach presents information first from the perspective of pasture plants, and then from the livestock perspective - helping farmers understand both plant and animal needs before setting up a grazing system. Flack presents all the practical details critical for sustained success including setting up anew system or improving existing systems, acreage calculations, fence and drinking water access, managing livestock movement and flow, soil fertility, seeding and re-seeding pastures, and more. 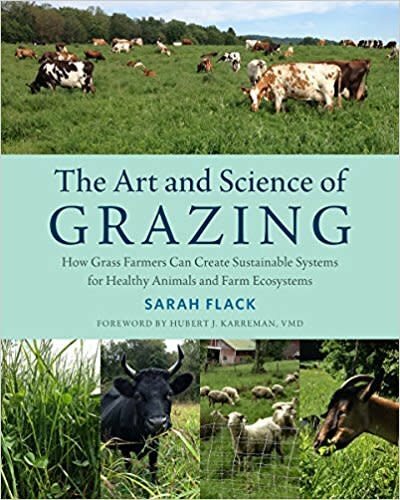 The Art and Science of Grazing is an essential guide for ruminate farmers who want to create grazing systems that not only meet the needs of their livestock, pasture plants, an soils, but the larger ecosystem as a whole.